“The world has finally caught on to what we’ve been saying for years: Juliana’s makes a damn fine pie,” says the Gothamist. To all the fans of Gustiamo and good pizza, today we are proud to announce that TripAdvisor has named Juliana’s Pizza the best pizzeria in the USA. That’s right, out of the ENTIRE United States, Juliana’s makes THE BEST pizza. What an honor, considering all the fantastic pizza in NYC, Chicago, San Francisco, and other cities around our nation that are known for their unique takes on the Neapolitan favorite! 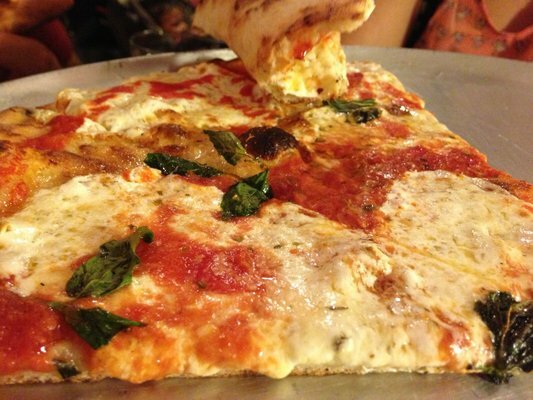 Why is Juliana’s pizza so “damn fine?” Well, it’s a combination of things, most importantly (imho) Juliana’s longstanding New York history, pizza legend Pat Grimaldi, and REAL San Marzano Tomatoes. Did you hear that about the “great tomatoes?” They are great, great-issimo and they define the Juliana’s Pizza, the #1 Pizza in the USA.